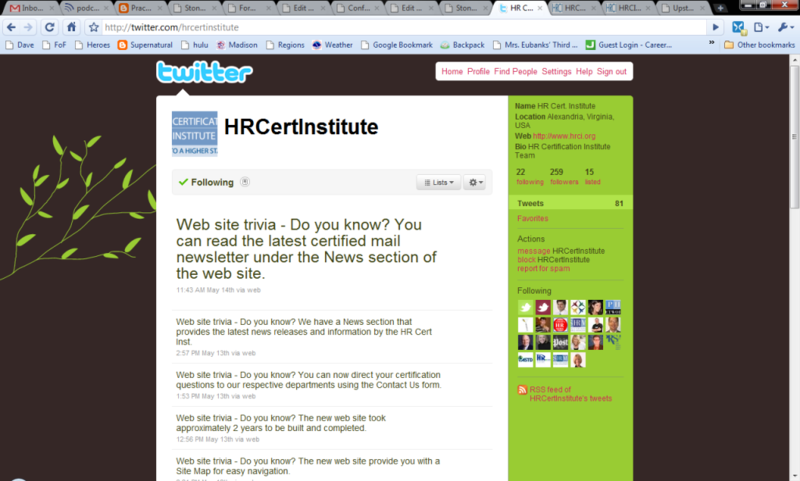 Near the end of last year, I realized that HRCI was on Twitter. Being a lover of HR certification, I was thrilled to see them there. I had a few back-and-forth chats with Alexis, and we shared a few tips and ideas back and forth. Fun was had by all. Although they were using their URL in every. single. tweet. I was still inclined to give ’em a break. Flash forward to the past few weeks. They’ve been doing work on their website. How did I know that? Well, they’ve tweeted over a dozen times in a three day period about what you can do on their website. Okay, so they’re sharing. That’s something, I suppose. Well, I hit their new site and want to log in (haven’t logged in since I took the exam last year). I kept getting a weird error. So I reached out via Twitter, asking if they could give me a hand with the issue. That was a week ago, and I haven’t heard from them since. Well, I figured if I couldn’t log in, I might as well check out their new site. So I rambled around until I found the blog. A blog. 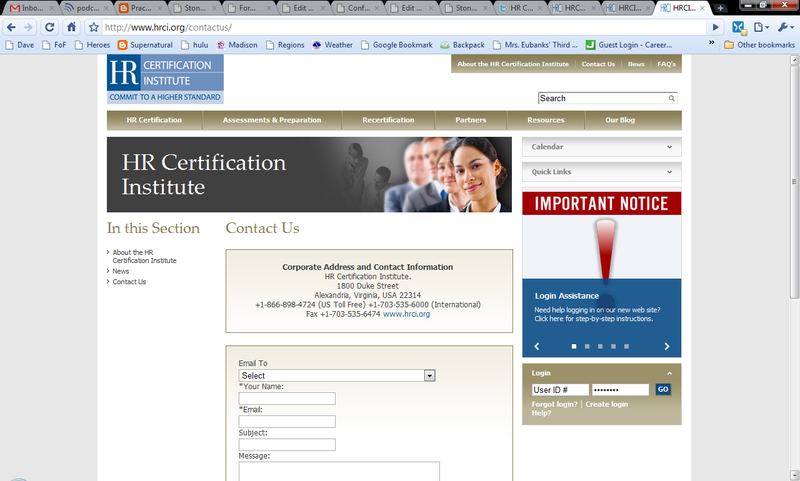 On HR certification. My nerdy little heart leaps with glee! So my first inclination, as any blogger knows, was to leave a comment telling them how happy I was that they had started a blog. But I couldn’t find out how. Now if I can’t figure out how to leave a comment on the blog, then you have a problem. I’m not just a casual visitor. I am adamant about leaving a comment that sparkles with sunshine and lollipops. I don’t know how everyone else was able to leave a comment when I couldn’t. If you have to be logged in first to do that, then I think they’re missing the point of the openness that is involved with social tools. If people had to be logged in to comment on my site, my comment count would be lower than HR’s chance of convincing the CEO that Facebook is a useful tool. 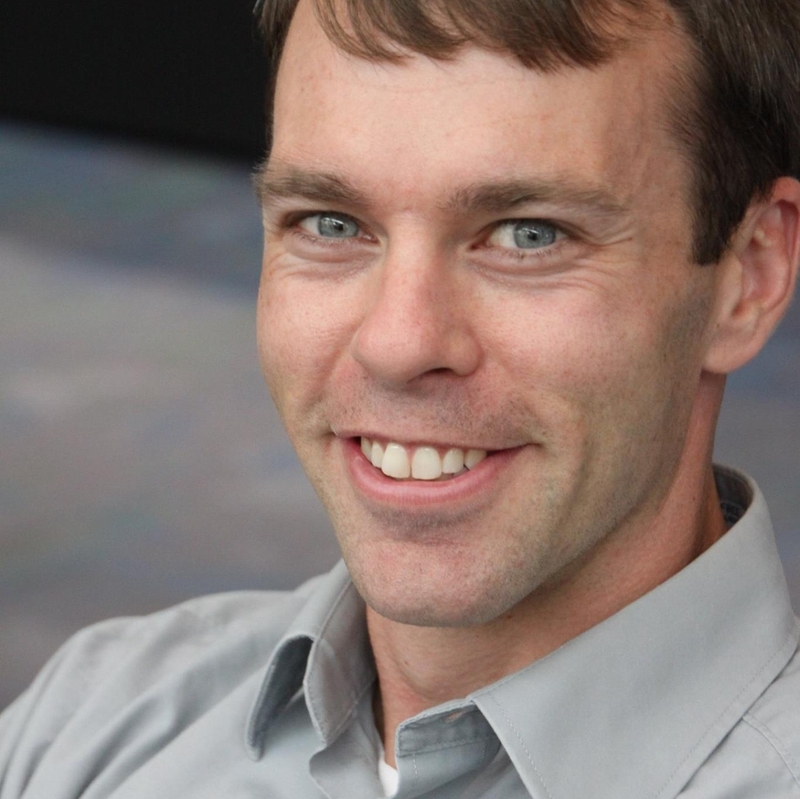 It’s everything Lance (and the rest of us) hate in a corporate blog. No personality. No soul. Just a bunch of press release-sounding posts. Be real, darn it. Stop tweeting only about your website and how people can use it. That should be 10-20% of tweets. The other 80+% should be connecting, helping people, etc. Don’t just be a taker. You won’t last in the social world. If you’re going to blog, it should be an informal avenue/peek into the organization. If you sprinkle in some news, that’s fine. But it shouldn’t be about you (the business) all the time. We can tell when you’re faking. If comments are purposefully turned off for non-logged in users (which I assume is the case), then you should cut out the code snippet offering comments. And IF they are purposefully turned off, then that’s just more reason that it’s not a blog and it is a press release generator. Interestingly enough, even though I never received any contact from them, check out the images below. The first is from Google’s old archived page. 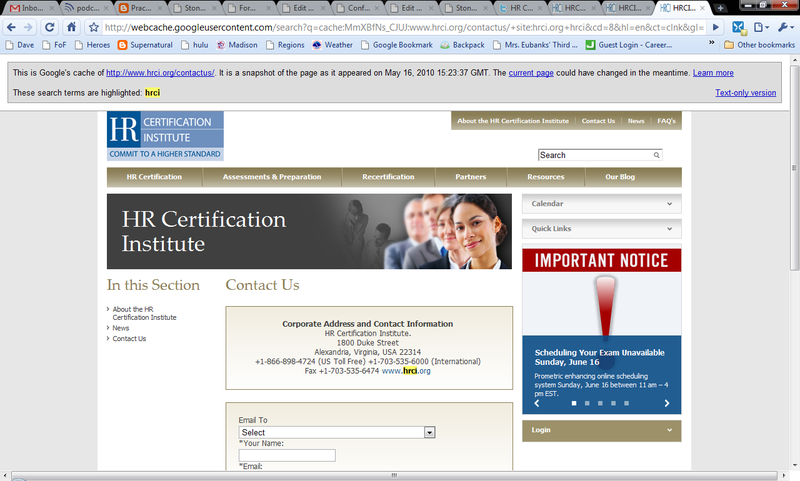 The sidebar has some important notice about something test-related. Now, if you look at the next picture, you’ll see that the sidebar item has changed. Maybe to help people like me w/login issues? I can’t prove it, of course, but it’s pretty darn coincidental otherwise. It’s all about making mistakes. I get it. I make my own on a regular basis. And I don’t hate you (promise!). But let’s get this thing fixed, okay? If you need help from someone in the HR community, there are dozens out here who know social media like the back of their hand. You just have to ask. 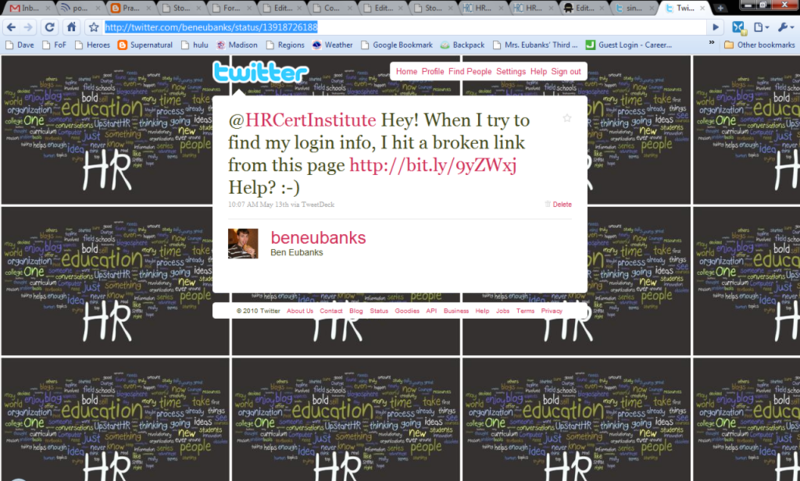 This entry was posted in General, SHRM and tagged HR Certification, HRCI, Human Resources Certification Institute, Social Media on May 21, 2010 by Ben. Nice post. It’s my first visit to your blog and although I’m not sure I can fill my comment with sparkles and lollipops, I did want to let you know that your post caused me to go back and double check the settings on my own blog to make sure they are as user friendly as possible. I did have to impose moderator approval on all comments recently due to being spammed over a weekend by over 3000 comments with links to various drugs from a Canadian company, but other than having to await my approval… which I grant quickly in most cases… they are open to everyone. Wowza, Becky! Sounds like you need to ratchet up your spam filter. :-) Have you tried Akismet? Free, easy to set up, and works wonders.